California and Florida Were “Hot Spots” for Winter Shows. Exhibitors and competitors who gathered for the NAILS Magazine Show held at the Holiday Inn in Tampa, Florida, on February 10-11 did more than hone their technical and business skills. Attendees enjoy a lively evening at the Yucatan Liquor Stand, and several entrants in a raffle won gift-baskets from Total Image and Forsythe Cosmetics Group. Barbara Marsh, a nail technician from Clear-water, Florida, won the grand prize: a four day, three night cruise and land vacation for two in Grand Bahamas, provided by Assured Vacations in Tampa. 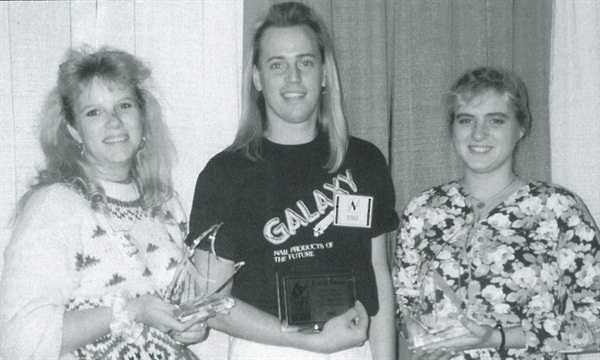 The California Cosmetology Association (CCA) sponsored the Capitol Beauty Trade Show February 3-4, 1991. Held at Sacramento Convention Center, the beauty show included exhibits, 10 educational classrooms, competitions, and main stage presentations. According to the CCA, the Sacramento show has grown each year. This year’s attendance was approximately 8,000, with more technicians entering competitions than before. Students Sculptured Nails and Professional Sculptured Nail competitions highlighted the nail activities over the weekend.